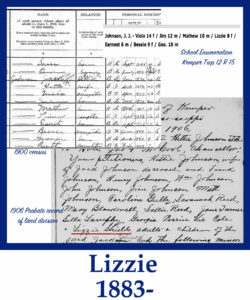 Lizzie, Elizabeth, Lou, Louvenia are given names listed on US Census and Educable children documents. Lizzie was born in 1883. Lizzie was listed on the 1906 Probate record for Hettie Johnson her mother. She had a married surname of Shields. A family member recalled a son and that Lizzie lived in California and died young. It was reported that her body was brought back to Kemper County for burial.